THIS IS A PREORDER. SHIPPING WILL START ON OR AROUND SEPT 28th. VALDRIN are one of the metal underground’s best-kept secrets. Hailing from Ohio, VALDRIN formed in 2010 with the intent to play a unique form of black/death metal using a lyrical concept called the “Ausadjur Mythos.” This story combines many aspects of various ancient mythologies and occult practices, all synthesized into one grandiose tale, told through the eyes of the protagonist Valdrin Ausadjur. The debut album Beyond The Forest was released in June 2014, garnering critical acclaim in reviews through many different zines, including Decibel. Since the release of Beyond The Forest, VALDRIN have been playing various live gigs throughout the American Midwest while completing the recording of their second album, Two Carrion Talismans. At last upon us, Two Carrion Talismans sees VALDRIN going from strength to strength. Undoubtedly death metal through and through, there is a pervasive sense of strangeness that seeps through every nook and every note of Two Carrion Talismans. Its compositions endlessly spiral and shapeshift upon themselves, all whilst maintaining a highly memorable quality; VALDRIN are truly grounded in METAL music, but choose death metal as the primary platform. And yet, with their seamlessly blended usage of synths adding a most haunting and even levitational quality, Two Carrion Talismans takes on a decidedly blackened aspect, imparting a sense of mysticism and even wonder to their muscular attack. It all blends together into a deliriously dark and daresay velvety experience, like drowning into an inky beyond much like the cover art’s protagonist. All told, VALDRIN in general and Two Carrion Talismans in particular impart a truly unique timelessness, one that feels vaguely/specifically mid ’90s “retro” on the surface, but more accurately – and more beyond/below said surface – an incredibly nuanced and textured approach to craftsmanship and narrative voice that soundly puts it in a class all its own. 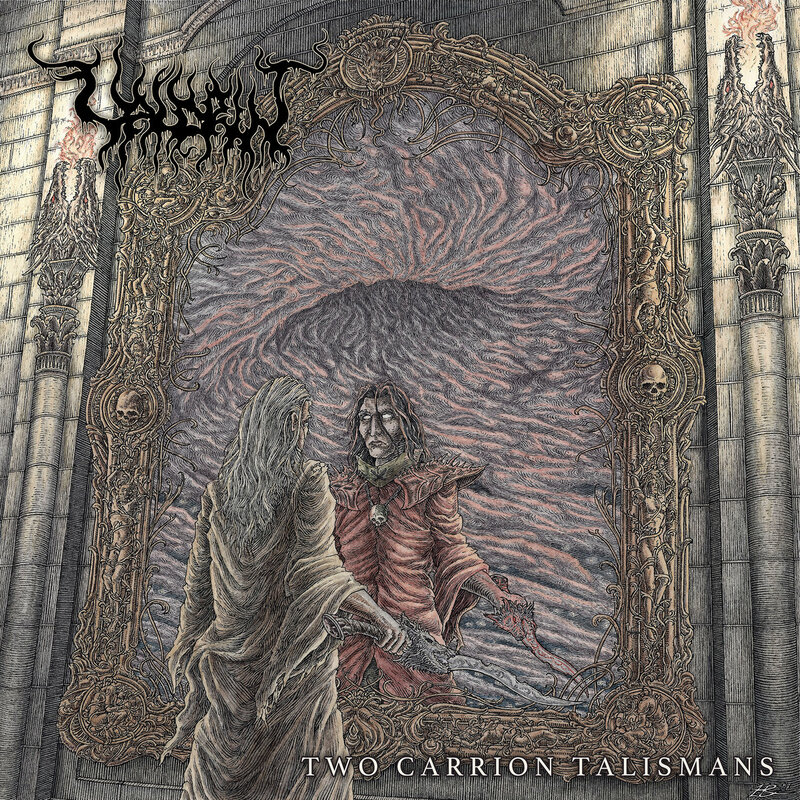 With more touring across the USA planned for this year, Two Carrion Talismans grandly marks the arrival of VALDRIN!